John Macky's 2nd edition of his Journey Through England published in 17221 describes a property in Twickenham as "A Little House, which belonged formerly to Sir Thomas Skipwith and was improv'd and inhabited by that great Architect the late Earl of Marr, with its hanging Gardens to the River, is well worth the curiosity of a Traveller...". p85 The Dowager Anne Connolly, sister to the Earl of Strafford, has a house here with good gardens. The building is very ancient. It was formerly the residence of the Earl of Marr, and of Admiral Fox. Later statements by Cobbett (Memorials of Twickenham, 1872, pp356/7), probably relying on Ironside, connect Skipwith and Erskine with Copt Hall. However, as shown presently, Macky was actually describing a different property. The Copt Hall estate stretched, during the first part of the 19th Century, from Holly Road, behind Heath Road, north to the river Crane. It came into the possession of Sir Charles Freake in about 1842 and the surviving house was demolished shortly after. The name is perpetuated in the road named Copthall Gardens. There are no known records showing that the property was ever owned or occupied by Sir Thomas Skipwith or John Erskine, Earl of Mar. The earliest reference yet found to Copt Hall being so-named, is in 1689 when it was briefly in the ownership of Sir Charles Tufton3. Tufton, from St Martin in the Fields, bought the property from Michael Wicks of London in 16884. At this time the property actually consisted of two houses, one newly-built, of brick ("muro lateritio") in the occupation of George Smith and Copthall (sic) itself, in the occupation of Thomas Webb. There was, at this time only a comparatively small amount of land attached to the houses; more was added during the 18th Century until the estate stretched for about 600 yards north to the River Crane (the "Old River"). Tufton returned the property to Wicks a year later. He had bought York House in the meantime and did not need both properties. Michael Wicks first bought the property from Sir Hugh Middleton (c1658-1702) and Robert Hampson in 16835. The Manor Court record of the transaction notes that the newly-built brick house was in the occupation of Edward Northey, Armiger and the second, as yet unnamed house was occupied by George Smith. The name Copt Hall does not appear and it seems that George Smith had moved from one house to the other, though clerical entries can be mistaken. Sir Hugh Middleton appears to have obtained the houses by inheritance fron Henry Poulton, being admitted, together with a large number of other Twickenham properties, in 16826. Henry Poulton (1618-1682) started paying rates in 1659; he was the son of Francis Poulton who had died in 1642 leaving his widow Susan (n�e Foster) who died in 1656. Wicks obtained a licence to let his properties in 16947. It may be reasonable to assume that he gave one of the houses its name, Copt Hall, between 1683 and 1689, perhaps to distinguish it from a third house on the land, which he may have built around this time. For much of its life Copt Hall was actually a small residential estate of three houses, bought and held by most of its successive owners as a property investment. In 1702 Michael Wicks sold to John Burgh8 and the occupiers were stated to be Fulk Lord Brooke in the brick house and the newest house, and Hammond (sic) L'Estrange in Copthall itself. Hamon L'Estrange had been active with land transactions since 1695 when he was described as "of Isleworth". He first paid rates in Twickenham in 1696. "...yesterday..we had a new kind of auction - it was of the orange trees and plants of your old acquaintance Admiral Martin - it was one of the warm days of this jubilee summer, which appears only once in fifty years - the plants were disposed in little clumps about the lawn; the company walked to bid from one to t'other, and the auctioneer knocked down the lots on the orange tubs..."
When the Admiral died his widow Mary inherited and on her death in November 1765 the property passed to a nephew, William Martin (later Captain) who was admitted in 176615. Captain Martin died in 1786/7 and his son, also William was admitted that year16. There was another son, George (1764-1847) who became Admiral of the Fleet. Various lands follow and there are references to the Ancient or Old River (the River Crane). These lands can be identified on the 1818 Enclosure Map, nos 224, 186, 187 & 188. This abstract of the Admission is a repeat of the previous entries on change of ownership through the century. It can be seen that the description of the property covered three houses: a Customary Messuage, a brick house in a two acre orchard and Copt Hall itself. All three houses were built by 1702. The pattern of occupation can be confirmed by reference to the Churchwardens Accounts. Occupants of the first two houses were stated to be Fulke Lord Brooke from 1701 until his death in 1710 although he was still down to pay rates in 1711, and then Lord Dunbar. Dunbar died in 1714 and his widow, the Countess of Westmorland stayed until she died in 1740. Lady Ann Conolly came later, perhaps in 1771 and left when she inherited Mount Lebanon in 1791. Copt Hall was occupied during part of this time by Hamon L'Estrange who paid rates from 1696 until 1728 when he died and then by his widow until her death in 1746. L'Estrange may have sub-let his part of the property between 1705 (records for 1705-07 are missing) and 1712 because his rates were only a few pence during these years. If so, his tenant could have been the Earl of Mar. This seems unlikely because the rate amounts do not match. An alternative explanation offered presently is that Sir Thomas Skipwith rented the house from L'Estrange for his mistress Susanna Gurney and their daughter Charlotte from 1707. During this year he was reconciled with his wife, who returned to live with him. 1708 was the last year in which he paid rates in Twickenham. There is no mention of Sir Thomas Skipwith nor John Erskine, Earl of Mar as either owners or tenants of Copt Hall in the early years of the 18th Century; indeed, apart from the four years in question the record shows the houses to have been owned and occupied by others. Nor, to be pedantic, did Lady Ann Connolly actually occupy Copt Hall itself; she lived in the "Customary Messuage" and her tenancy included the brick house. This raises the question of where was Skipwith's house, described by Macky as "improv'd and inhabited" by Mar. Sir Thomas Skipwith, 2nd Baronet, of Metheringham, Lincolnshire19 lived in Twickenham between 1701 and 1709. When he died in June 1710 he was in possession of copyhold property and land of the Manor of Isleworth Syon and an adjacent freehold property. His son, Sir George Bridges Skipwith also lived in Twickenham for a short while, paying rates between 1713 and 1716 or 1717. In 1701 Sir Thomas bought a copyhold property including a house and orchard known as the Osier Ground, of about 3/4 of an acre by the River Thames from Edward Wintour of London20; and in 1707 he bought a further small piece nearby from Mary Birkhead21. Mary was probably a relative of Edward Birkhead (d1663) whose house, later rebuilt as Richmond House she had sold to Francis Newport in 1682. Edward Wintour only paid rates for three years, from 1699. Thomas paid a similar amount, almost certainly moving into the property, with its stables noted in the transfer by Mary Birkhead. In addition, Sir Thomas acquired adjacent freehold property. The record of his purchase is not available: it pre-dates the start of the Middlesex Deeds Register, however it can be deduced from the transfer by his son to Dr William Battie in 1741. This transfer, recited in Appendix A, describes land bordering the Thames whose house had recently been burnt down. All these properties made up the estate later known as Lord Denbigh's, then Dr Battie's and finally Poulett Lodge. Thomas attended Vestry meetings at St Mary's Church from time to time, the first being on 23 November 1702 when, as one of the Quality, his signature headed the list of those present. Thomas made a will in August 1705 and it is shown in Appendix B. He bequeathed his house and contents to his wife Margaret apparently already possessed of them but living in another, new, house of her own in Stratton Street, Piccadilly. It is not entirely clear to which house Thomas is referring but in due course his son inherited the Twickenham property. Lucy Skipwith, his beloved daughter was to receive an annuity of £200 a year, ceasing with a sum of £4,000 on marriage funded from his estates at Metheringham and Sturton in Lincolnshire. His housekeeper Susanna Gurney and her daughter Charlotte received annuities of £30 each a year, commutable into capital payments of £500 when Charlotte reached the age of 16. Charlotte would inherit the manor of Sturton in the event there were no male heirs from his daughter Lucy or George, his son. His trusty and well beloved servant John Vanter was to receive £20 a year or £100 outright. The remainder of his estate was bequeathed to his beloved son George who was also appointed executor. The will was drawn up in Twickenham by Thomas himself, being witnessed by Simon Reeves Senior, Adam Postern, Edward Reeves and Thomas Jackson, all known to be Twickenham residents. Thomas added a codicil in June 1710, the month of his death. He made a number of further bequests to servants and one of £100 to the daughter of his friend John Lund, his goddaughter, and a revised sum of £1000 to Susan (sic) Gurney who had apparently now married John Vanta (sic). Lands had been sold for this purpose to John Lund and Mathias Perkins (another Twickenham resident). It is evident from the 1705 will that all was not well at that time between Thomas and his wife. She was, alone among his family, unbeloved and appeared to be living separately from him, in London. This diagnosis seems to be confirmed, though matters had improved, when Isabella Wentworth wrote to her son in 1707: "Sir Thomas Skippoth has turned out his hoar, and is grown a very good husband, his lady lives with him hear...I sopose he wants money and soe weedles her." It may perhaps be presumed that Susanna Gurney had been his mistress and Charlotte his illegitimate daughter. Isabella Wentworth also suggested that Thomas was short of money. at this time. It is likely that his wife was better provided for: she had shared in the inheritance of her father, George, 6th Baron Chandos (1620-1655) of Sudeley. She may also have inherited from her first husband, William Brownlowe. It is conceivable that, as suggested earlier, Skipwith rented a part of Copt Hall for his mistress and their daughter from 1707 and that this arrangement gave rise to the belief that it was actually his property. No doubt he continued to visit. After George succeeded to the title, in 1710, he came to live in Twickenham for a few years (paying rates from 1713-c1716)22 but he failed to seek admission to the copyhold lands at the Manor Court. He rectified this only in 174023 when he wished to surrender them to Dr William Battie. Even now there was a delay, as Dr Battie did not turn up to be admitted until the following year24. Dr Battie sold his various holdings in 175825, some to Nathaniel Lloyd. Lloyd died in 1774 and his death was proclaimed. He bequeathed his holdings to his niece Mary, wife of the 3rd Earl Poulett26. Skipwith's house, as enlarged by Mar was known, a little later, as Lord Denbigh's. William Feilding, 5th Earl of Denbigh lived here between 1728 and 1733, paying £1.10s when the rate was 6d. Horace Walpole relates that, when lent to M. Chavigny, the French Ambassador27 it burnt down and was replaced by the house built by Dr William Battie and from about 1762 known as Poulett Lodge. There is no reference to the French Ambassador in the rate books, and none to Lord Denbigh after 1733; in fact Dr Battie does not actually appear to pay rates until 174328. It seems that re-building after the fire took several years, or Dr Battie let his new house until he was ready to move to Twickenham. 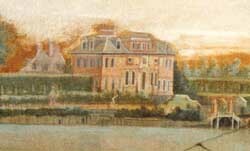 Lord Denbigh's house can be seen on Peter Tillemans' A Prospect of Twickenham, painted in about 1725. It is a house of considerable stature, fit for an ambassador needing access to Richmond and Hampton Court and advertising the standing of his monarch. It has formal gardens, descending in (hanging) terraces to the river and adorned with statuary. The house is flanked by long hedges to each side which terminate with garden pavilions. In front of the hedges is a long row of small trees, columnar and round alternating. Further rows of trees stand on the lower terraces and there are another four pavilions at intervals. at the riverside there is what appears to be a dock capable of accommodating a state barge in privacy, over the entrance to which is an elegant and decorative footbridge. To the right hand side is a range of stable buildings with a cupola and a cottage. Stylistically the house is something of a puzzle and suggests a sequence of building additions and cosmetic alterations. It may have started life with the centre section only, later having wings on both sides added. The wide attics may, too, have been later additions. This, it could be held, was the work of "that great Architect the late Earl of Marr", so described by Macky, and carried out during Mar's residence in Twickenham between 1709 and 1712. Appendix A shows he was paying rates for these four years, probably in succession to Skipwith who paid no rates after 1708. While this building work may have been undertaken by Sir Thomas Skipwith, it could have been by his son, Sir George when he inherited in 1710.29 But one wonders just why either of these Lincolnshire Baronets went to such trouble, unless it was Thomas's well-connected and wealthy widow who actually put up the money. What is not known is what these three men had in common nor how they came to know each other. John Erskine (1675-1732), became the 11th Earl of Mar on the death of his father in 1689.30 His first recorded presence in Twickenham was 6 April 1703 when he married Margaret, 1st daughter of Thomas Hay, who became the 7th Earl of Kinnoull in 1719.31 One wonders who hosted the wedding celebrations and why the marriage was in Twickenham. Perhaps Mr Secretary Johnston offered hospitality from his property just downstream and where he was contemplating building the new villa which he completed in 1710. Erskine and Johnston must have known each other, although of quite different religious persuasions; both Scotsmen they were at different times Secretaries of State for Scotland. More likely perhaps. Erskine was already friendly with Sir Thomas Skipwith and the marriage was celebrated at his house. Margaret died in 1707, aged 20. On 20 July 1714 Mar married again, Lady Frances Pierrepont, sister of Lady Mary Wortley Montagu (1689-1762), at Acton. Their father was Evelyn Pierrepont, Earl of Kingston, Marquis of Dorchester and, in 1715, created Duke of Kingston. Their mother was Lady Mary Feilding (d1692), a daughter of the 3rd Earl of Denbigh. Mar was an enthusiastic amateur architect: he produced drawings of the grounds of Secretary Johnston's house and of Ham House, in 1711. These included projects for development, in particular for a house where Marble Hill House was built later. In 1721, while in exile in Paris, he produced a design for a quite radical embellishment of Secretary Johnston's House. Mar also enjoyed a strong relationship with James Gibbs who, by his will, bequeathed £1000, three houses in Marylebone and all his plate to Mar's son, "in gratitude for favours received from his father the late Earl of Mar". TN THE NAME OF GOD AMEN The day of August in the year of our Lord God 1705 I Thomas Skipwith Baronet in the County of Middlesex and Parish of Twitnham being of perfect mind and memory thanks be given to God I do make and ordain this my last Will and Testament in manner and form following that is to say first and chiefly I give my soul into the hands of Almighty God who gave it me And my body I commend to the Earth to be decently buried in Christian Burial at the discretion of my Executor nothing doubting but at the general Resurrection it shall recieve the same again by the mighty power of God As touching my worldly Estate wherewith it hath pleased God to bless me I give devise bequeath and dispose the same in manner and form following that is to say that in the first place I leave my House and Furniture and Plate and jewells that are at this time in the possession of my Wife Margarett Skipwith at her new dwelling House in Stratton Street near Piccadilly in the Parish of St Martins for and during her Widowhood only Next I give and bequeath to my dearly beloved daughter Lucy Skipwith Two Hundred pounds of lawful Moneys of England a year to be paid her Quarterly out of all my Estate till she Marrys and then I give her Four thousand pounds of lawful Money of England to be raised out of any part of my Estate but in one particularly out of my Estate at Netheringham and Sturton Next I give and bequeath to my present Housekeeper Susannah Gurney Thirty pounds a year for and during her naturall Life And to her Daughter Charlott Gurney Thirty pounds for and during her natural Life or Five hundred pounds in money which they shall choose when and after Charlott Gurney the Daughter shall attain to the Age of Sixteen Next I give and bequeath unto my trusty and well beloved servant John Vanter Twenty pounds a year for and during his naturall Life or One hundred pounds in Moneys which he shall choose which said Thirty pounds a year to Susanna Gurney and Charlott Gurney her Daughters Thirty pounds a year and the Twenty pounds a year for John Vanters Life or One hundred pounds mentioned and the Five hundred pounds mentioned to Susanna and Charlott Gurney shall be levyed and raised out of my Farme at Uxbridge commonly called by the name of Neales Farm in the Parish of Denham County of Bucks And I doe likewise give and bequeath to Charlott Gurney my Mannor of Sturton in Lincolnshire if my Son George Skipwith and my Daughter Lucy Skipwith should chance to dye without Heirs Males And of this my last Will and Testament I make my beloved Son George Skipwith after my debts and Legacies paid my sole Heir and Executor hoping he will be carefull to performe and obey this my last Will writt with my own hand And I do hereby utterly disallow revoke and anull all and every other former Testaments Wills Legacies Bequests and Executors by me in any wise before this time named willed and bequeathed ratifying and confirming this and none other to be my last Will and Testament In Witness whereof I have hereunto set my hand and seal the day and year above written ./. Tho Skipw'th ./. Signed Sealed publish pronounced and declared by me Thomas Skipwith Baronet as my Last Will and Testament in the presence of us Simon Reeves Senr Adam Postern Edw: Reeves Tho: Jackson BE IT KNOWN UNTO ALL MEN by these presents that Whereas I Sir Thomas Skipwith of Twickenham in the County of Middlesex Baronett have formerly made and declared my last Will and Testament in writing I do by this present Codicill ratify my said Will and do also hereby give devise and bequeath as follows Imprimis I give devise and bequeath to my good Friend John Lund of the Parish of St Dunstan in the West London Goldsmith the summe of Twenty pounds to buy him Mourning Item I give devise and bequeath unto my Goddaughter Anne Lund Daughter of the said John Lund the summe of One hundred pounds Item I give devise and bequeath unto my Servant George Helstead Ten pounds to buy him mourning and Ten pounds more in full for his Wages Item I give devise and bequeath unto my Servant John Lewis Ten pounds and both his Harps Item I give devise and bequeath unto Samuel Mingoe my Blare (?) Five ponds and Five pounds in full for his wages Item I give devise and bequeath to Morgan Davies my Laundress Ten pounds besides what shall be due to her for wages at the time of my death And whereas I have by Deed bearing date on or about the First day of this Instant June assigned several lands to the said John Lund and one Mathias Perkins for the payment of the Summe of One thousand pounds after my decease unto Susan Gurney als Vanta I do by this present Codicil give devise and bequeath unto the said Susan Gurney als Vanta to her by my Executors in my said Will mentioned Provided always and my express Will and meaning is that the said Susan Gurney als Vanta shall not be entitled to more than the summe of only One thousand pounds in the whole either by vertue hereof or of the said Deed And my Will and meaning is that this Codicil or Schedule be and be adjudged to be part and parcel of my last Will and Testament And that all things herein contained and mentioned be faithfully and truly performed as fully and amply in all and every respect as if the same were so declared in my last Will and Testament In Witness whereof I the said 5r Thomas Skipwith have hereunto set my hand and seal this Fifth day of June in the Ninth year of the Reigne of our Soveraign Lady Anne by the grace of God of Great Britain France and Ireland Queen defender of the Faithe Anno Dm 1710 /. Tho. Skipwith./. Sealed Signed published and declared by the said Sr Thomas Skipwith in the presence of us who have subscribed our names as Witnesses in the presence and at the request of Sr Thomas Skipwith Anna Pocock Anne Hoston Tho. Clement. 1	The first edition was published in 1714. It noted the residence in Twickenham of “(Thomas) Boucher, the famous ganester, the Earl of Marr, the Earl of Strafford, the Earl of Bradford, the Lord Brook, the Lord Dunbar, the Lady Falkland and Secretary Johnston”. Although Macky probably wrote this in 1711-12; it was already out of date. Thomas Boucher and Lord Bradford had died in 1708. Lady Falkland, widow of the 5th Viscount died in 1709. Lord Brook died in 1710, at Twickenham according to Horace Walpole in his Book of Materials c1759, quoting Leneve's Monum. Anglic. p205, although he was still down to pay rates in 1711. 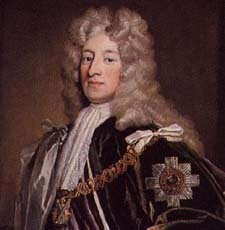 The Earl of Marr did not pay rates after 1712. Macky could not have been writing before 1711, when the Earl of Strafford's title was revived for Lord Raby. 3	The land was copyhold of the Manor of Isleworth Syon. The Court Books are held by the London Metropolitan Archives, Accession no 1379. Dates quoted record the admission and surrender at the Manor Court. The actual contracts of sale between the parties were, normally, during the six months prior to registration at the Court. 2 Sir Thomas m. Margaret da. & co-heir of George (Brydges), 6th Baron Chandos of Sudeley (1620-1655) & widow of William Brownlowe Esq of Humby. 22	He may have remained until 1717, but there are no Churchwardens Accounts for this year. Between 1717-19 he was, as a trustee, one of the defendants in the Case following the re-building of St Mary's Church in 1714 when a number of tradesmen sued for non-payment of their bills. 26	ACC 1379/48, 6 April 1774, p296: first proclamation of the death of Nathaniel Lloyd. p355: admission of Mary Poulett the niece of Nathaniel Lloyd. According to Repertorium der diplomatisehen Vertreter slier Under, Vol II, ed Friedrich Haussmann, Zurich, 1950 p1 10 he was in England from 1729 to 1737. His career included appointments as French emissary to Spain, Genoa, Parma, Tuscany, the Austrian Netherlands, England, Hanover, Mainz, Denmark, Portugal, Bavaria and the Empire, Sardinia, Venice and, finally (1753-62) Switzerland. He was Governor of Beaune. 28	Dr Batty had been involved in other property transactions in Twickenham at this time. In 1740 there were claims for rates due from Dr Batty or Mrs Adams amounting to 5/-, abated, and that year Mrs Adams paid a rate of 1/8d “for Dr Batty's Garden”. 29	Sir Thomas Skipwith died in 1710. According to the Churchwardens Accounts Sir George Scipworth (sic) was living in Twickenham, presumably in the same property, in 1713 when his rates were 15/6d at 6d, and 1716 when they went up to £1.00, also at 6d. This suggests a revaluation following alterations to the property or its extent. He had left by 1718. 30	The lineage was complex. CP states he was 22nd and 6th.